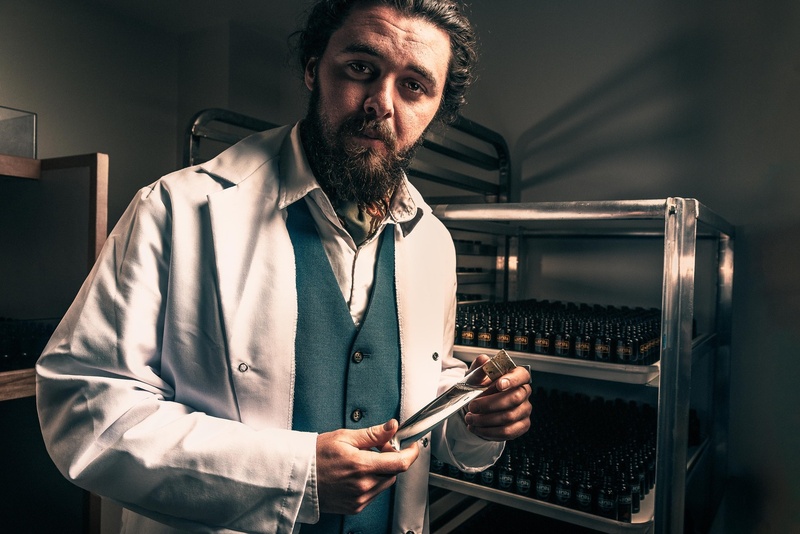 The owner of HoneyOriginal.ca out of Brantford, ON shot on a Nikon D750 and Tamron 28-75mm f6.3 1/200s ISO 125 at 28mm to capture more of the room and the test tube in his hand. Shot was lit with Godox AD200 on medium strength ( not recorded ) in their medium soft box with both panels of diffusion and the grid modifier. 3 additional small LED lights used to light the scene. The key light was setup upper right of subject for Rembrandt Lighting. Luminosity masks on raw exposure-shifted layers in post helped to keep shadows from being lost while maintaining the dark look of the shadows. Some lightening in the eyes. Liquify to help with lens distortions to subjects face. Color graded using gradient maps on soft light. Sharpened with High Pass. Noise added for cohesiveness.